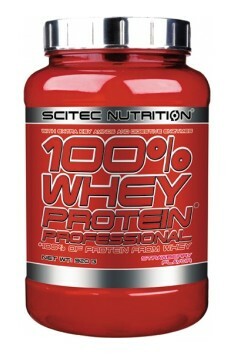 Scitec 100% Whey Protein Professional is a high quality protein supplement based on concentrate and whey isolate. The product perfectly complements the daily requirement for amino acids and supports the building of muscle mass. In addition, the manufacturer has included the composition of enzymes that help to absorb the contained in the supplement amino acids easier and faster. The product is a combination of concentrate and isolate of whey protein. Both proteins, though similar, differ slightly in the rate of absorption. The concentrate contains a larger amount of carbohydrates and fats, and its absorption time is from one to three hours. The isolate has a higher percentage of amino acids, which can reach 90% of the protein content, and thus has fewer carbohydrates (also lactose) and fats, which is why its absorption time is about one hour. The whey protein concentrate has a very high bioavailability, measured with a helpful BV (biological value) scale, which determines to what extent amino acids can be absorbed and used by the body. The whey protein concentrate has BV = 104, which indicates an appropriate aminogram, because the higher is the BV value, the better is its bioavailability. The model is egg white, which has BV = 100. The whey protein isolate, on the other hand, has BV = 159, which provides the body with the ability to fully utilize the amino acids that it contains. The producer has included in the supplement two enzymes supporting digestion of proteins isolated from pineapple and papaya. Bromelain and papain contain a mixture of proteolytic enzymes that facilitate the breakdown of peptide chains to obtain individual amino acids. It shortens the time of digestion of protein, and in addition can protect against disruption of the digestive system, especially in people with inefficient enzymes responsible for the hydrolysis of peptide bonds. The most important regulator of the synthesis of new muscle proteins is the amino acid L-leucine, which can increase the synthesis of muscle proteins regardless of the presence of other amino acids. The producer additionally placed in the preparation as much as 100g of L-leucine in a portion to increase the efficiency of building the muscle mass. In addition, the product has been enriched with a larger amount of L-glutamine which participates in the synthesis of the new muscle proteins and nitrogen transport, as well as taurine which regulates the water and electrolyte balance, creatine transport and muscle contractility. The supplement is characterized by a high content of not only the endogenous amino acids, which the body can produce itself, but also the exogenous amino acids, which have to be supplied with food. Only such a combination ensures a comprehensive operation of the supplement. Although, as mentioned above, L-leucine increases the rate of synthesis of the new muscle proteins, it is necessary to supply the remaining amino acids so the anabolic processes could take place. In summary, Scitec 100% Whey Protein Professional is a high-quality protein supplement based on the concentrate and isolate of whey protein. This combination is characterized by a high bioavailability and the addition of enzymes that facilitate peptide decomposition accelerates the digestion process. The high content of one of the most important amino acids in the synthesis of new muscle proteins (L-leucine) together with the remaining amino acids provides the appropriate anabolic environment. Dissolve one portion (30g) in 200-300 ml of still water or milk. Depending on the individual needs, use one to three portions a day, especially during breaks between meals and after training. Due to the rapid absorption time and high bioavailability of amino acids, it is recommended to consume the portion immediately after training to increase the efficiency of anabolic processes. The daily supply of protein, depending on individual differences and training goals, ranges from 1.6 to 2.2 g per kilogram of the body weight. Protein is the basic building block of muscle tissue, however, in order to achieve the effect of anabolism, it is also necessary to increase the supply of energy components (carbohydrates, fats). To achieve the muscle anabolism, we recommend a caloric surplus of 120 to 200 kilocalories per day. Fenugreek is used for improving digestion and stabilizing blood sugar. Source of laxogenin, a supplement promoting anabolic processes and speeding up body fat reduction.